Who owns Mind Wars from Starlord? IPC? Don't let Grant Morrison here you say that! This thread is a like trying to bottle smoke. Even if there could be a definitive list of who has the rights to what, those rights can be changed or might revert back to someone else at any point. Ridgway also goes into some detail about the contracts of the period. ...and while I was starting this thread, the ink was drying on the grand Rebellion / most comics from the 1970s/1980s contract! This link was just posted on another thread - it's mostly about Zenith, but there are also interesting titbits concerning Medivac 318, Zippy Couriers and Chronos Carnival. Just had a thought -- who owns One-Eyed Jack? If Rebellion now have it, it would be awesome to have a new story by Wagner. Cinergi Pictures produced the film, judging from their Wikipedia page, the rights either went to Disney (who distributed the 95 Dredd film), or maybe producer Andrew G. Vajna (who currently runs The Halcyon Company). I'd also like to direct everyone's attention to my new thread discussing ownership of Time UK's comic book properties. The Dredd pinball game was made by Bally Midway, which has since been bought out by Warner Bros.
Other Dredd games were published (and are presumably still owned) by Virgin (which was bought out by Interplay, who is now selling its assets), Atari (owner of the Melbourne House and Gremlin Interactive libraries), Tin Man Games, and Kuju Entertainment. Throwback Entertainment currently owns most of Acclaim's game titles. Perhaps they own Acclaim's Dredd games. Also, a company called FarSight Studios put a game called The Pinball Arcade on Steam, which includes a Dredd board. Rebellion does outright own Dredd vs. Death and Dredd vs. Zombies. I was wondering this also. I would love to see this all reprinted. Excellent art by John Cooper. I suspect though that Rebellion don't own him as he was created for Valiant (albeit he was created in the 1970's). My understanding was that any characters created for Valiant were not owned by Rebellion. Would be great if that was not the case though. I wanna say that Rebellion owns any IDW comics based on 2000AD properties. Though The Topps Company owns the Mars Attacks Martians, 20th Century Fox owns Aliens and Predator (with Dark Horse Comics owning certain rights to the crossovers), and Pat Mills and Kevin O'Neill owns Marshal Law (he guest starred in a Dredd story). 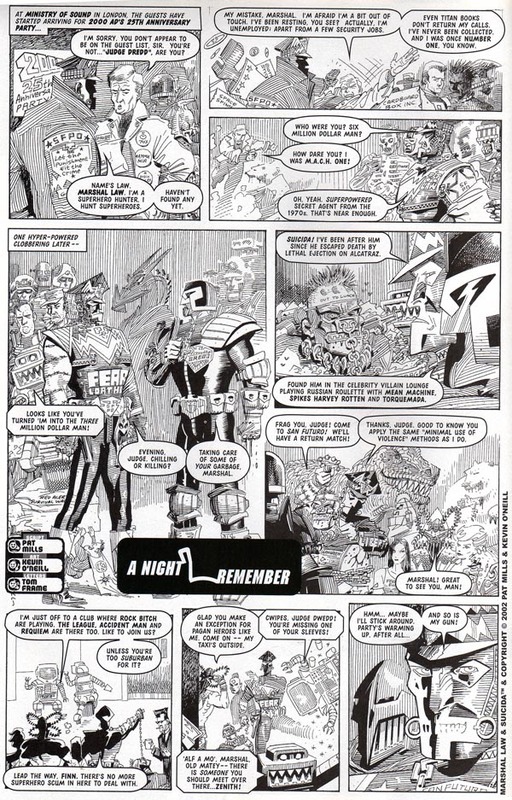 And the Comic Relief Comic (released in 1991 by Fleetway) which features Dredd, is a cluster of copyrights. and Pat Mills and Kevin O'Neill owns Marshal Law (he guest starred in a Dredd story). He did? I don't remember that one! * or was it some other large-chinned 'celebrity'? I don't do celeb-culture so couldn't comment. Pat Mills and Kevin O'Neill owns Marshal Law (he guest starred in a Dredd story). Ha! I see Amok there too.